This product was discontinued by the manufacturer. The Honeywell AM-1 series accurately adjusts, maintains and limits the hot water temperature to a desired setting selected by the user. 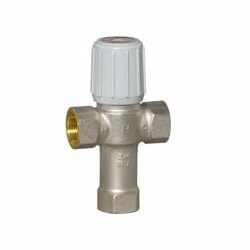 In domestic water applications it offers scalding protection and bacteria growth control. By installing a Honeywell AM-1 mixing valve and raising water heater storage temperature setting and limiting mixed outlet water temperature to safe temperature more usable hot water is available. In heating applications it provides comfort and protects the equipment. Designed for easy maintenance and element replacement. Teflon® coating of internal valve components to prevent mineral build-up and extend life.